Social media for business has hit the marketing world like a truck on the open road of tradition. It’s taken the rule book, torn it in half and then shared the image on the Internet. For many marketers and businesses, the sheer speed of social media and the totally uncontrollable trends have left them reeling, wondering if they’re ever going to recover or market effectively again. But some businesses and brands have absolutely nailed it. They saw that truck coming and not only dodged it, they built their own 18 wheeled marketing machine and are driving it into the new world with all the lights and cargo they could’ve ever wanted! Yesterday I commented on a post on Google+ about the Sauber F1 team. They had ironically posted on Facebook how brilliant Google+ was, and the Google+ fans were chuckling and +1ing all over the post. “That makes my day” said one comment, and I chipped in with a comment about Mark Zuckerberg and how he’d be annoyed with his platform being used to promote its successor (in my eyes). But almost immediately the Sauber F1 Google+ page commented and stuck up for Facebook, praised Google+ and asked what all the fighting was about – impressive, social, and very thought-provoking at the same time. Facebook – it’s easy when you’re a big brand, right? The Sauber F1 team are huge; they’re a brand recognised all over the world, so Facebook is simple for them – they get likes whilst they’re sleeping (or racing), right? Well according the to Sauber team, their following on Facebook has grown dramatically recently but with no budget at all! Although it helps being a huge brand with an existing fan base, they said that regularly adding great quality content was the only way they were succeeding. I begged to differ, but they had a point, one I drill home all the time – quality content gets shared and builds an audience. The Sauber team are certainly ‘social’. They interacted with ease on the Google+ post and a quick look at their Facebook showed a page which is very much alive and kicking with quality and engaging content for their 180,000 and counting fans. 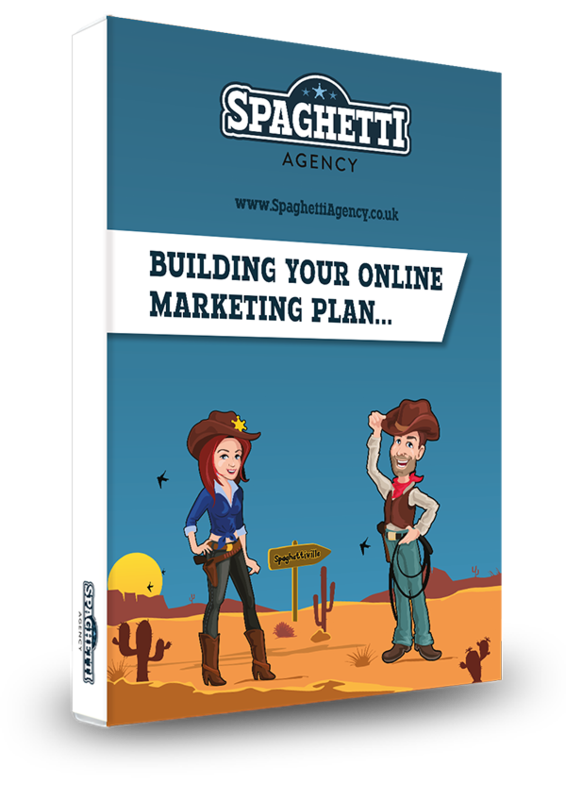 The key point here is they’re building relationships and actually asking questions, having an opinion, and using Facebook like a social network… with splattering of a worldwide brand’s marketing images and support. On the Google+ post they disagreed with me (and Duncan Rice) on a few points about Facebook. I respect that they have an opinion and they’re not afraid to stick to it! Have Sauber F1 broken the Facebook Algorithm? Could this be true? They have had a huge soar in likes recently. Could there be a point where the algorithm on Facebook actually goes back to the old days where everyone saw you all the time and every ‘like’ shares your page on 1000s of new profiles? Sauber have said that they don’t have a budget for Facebook and that they put the rise in likes down to great content. But I’m convinced it’s a combination of having a well-recognised brand and having grown to a size where algorithms can’t affect them, or at least they’re so big it snowballs. Getting to the point where you have 80,000 followers is a tricky task of course, and I’m sure Sauber have been on Facebook for a long time. Starting from scratch on Facebook nowadays is a huge task and I don’t think companies can get to the point Sauber are at now without budget, advertising, and huge recognition elsewhere. Buying likes – a step ladder to algorithm silence? I also had another conversation about Facebook this week on Google+ along similar lines. A blogger had posted that everyone should stop whining about Facebook (is that me?!) and start using the platform in a better way. You can read the blog post here. The comments on the post were interesting. Many disagreed with the post, saying that it was ‘BS’ and that posting every 3 hours was time-consuming and spammy. When I looked at the Facebook Page it wasn’t anything special in my opinion either, and considering the number of likes, the comments were low in comparison and the interaction seemed low too. 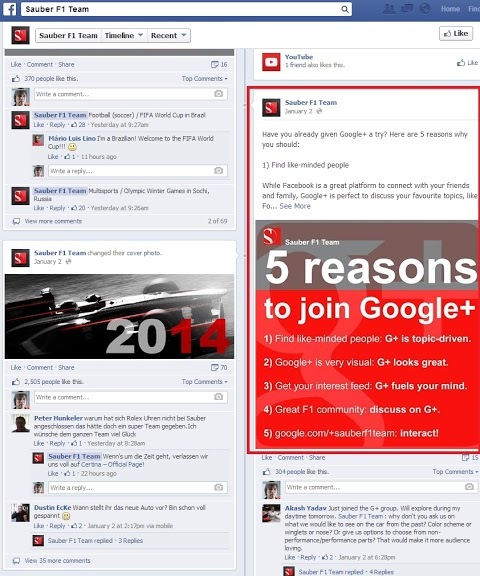 Sauber’s page is a lot more conversational, funny, and alive – with a real sense of community. There was a comment about buying likes in the blog, which I can never understand; surely you need a targeted audience? If you buy X number of likes to get above the threshold of Facebook’s algorithm (if that does exist) you could then create a great page that people saw all the time, like Sauber have, and then grow and grow to a serious sized page and gain real likes from real engaged people. You could buy 60,000 likes from a man in India (totally un-targeted to your brand or business) then start posting and creating a really good page and people would actually see it. If this is possible, and if the Facebook algorithm does stop at a certain point, it could make Facebook click farms even busier! It goes to show how powerful social media is, but also how powerful it is to join in. Sauber didn’t ask the author of the post to change it; their interaction said it all and the author corrected his title. Duncan wasn’t wrong, he just misinterpreted Sauber’s post – we’re all human, and we’re all on social media being ‘human’. 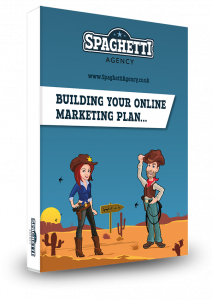 If you’re going to be on social media then make sure you have the resource to do it. It takes time to build an audience and then more time to engage and keep them engaged. It also takes time to monitor the world of social media to ensure that your message is not only getting out there but being interpreted correctly. Buy likes? Well I never said that you should do that, it’s never going to give you a tailored fan base, but it may just be a glitch in the Matrix of Facebook that marketers could manipulate… who knows? Is Facebook harder than ever, or do we all need to change tactics? Do you pay for advertising, or just post religiously? What do you think the future of Facebook for business holds?